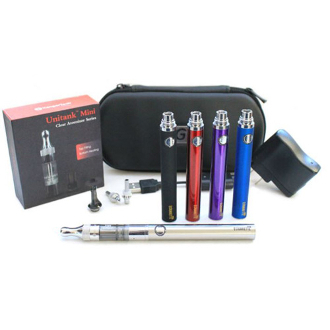 The EVOD 1100 Battery Unitank Clearomizer Kit is a powerhouse combination of strength and contour. It is compatible with all of the eGo batteries, although it creates an exceptionally efficient look once paired with the Kanger UniTank mini. The two work together as a great team, giving you tons of vapor and hours of vaping. Both also come in several different colors. They, along with your eGo case, allow you some fantastic color choices to customize your kit. The Kanger mini Unitank is that the 1st bottom coil clearomizer to fill from the top. The distinctive style boasts 2 chambers within the tank. These chambers are separated by a spring activated seal that seals off the bottom of the tank while liquid is being replaced. Another nice feature of those tanks is that they're rebuildable. This gives you the opportunity to take out the coil wicks, replace them and reuse your clearomizer over and over. The 1100mAh EVOD is one of our newest editions to our eGo battery line. This battery will give you approximately 1.5 days of vaping on a charge. With a recessed button, it is an extremely comfortable battery to use and looks very streamlined. Turn the tank upside down and unscrew the base assembly cap from the bottom of the tank. Remove the center tube and the spring from the old coil. Unthread the old coil from the base cap. Slide the spring back on the center shaft of the new coil, slide the center metal tube on to the center shaft over the spring. Reinstall the base assembly into the tank. Fill with approximately 2.0ml-2.4ml of e-liquid by tilting the PRO Tank at a slight angle and dripping juice down the inside wall against the outer wall of tank. Do not let eliquid flow into the center tube, this is the air flow tube, liquid will leak out the mouth piece. Screw the top cap assembly back onto the tube, the spring loaded center tube will be pushed back in to seal the coil and open the lower chamber Screw onto electronic cigarette device and you're ready to vape. Let the UniTank sit for a few minutes when first filling with liquid, this will allow the liquid to absorb into the coil wicks. Firing the UniTank with a dry coil can cause burning of the wicking material and possibly ruin the coil. Remove the clearomizer from the battery. Attach the EVOD battery to the charger by screwing it onto the charger port. Allow to charge for 3 hours. When finished charging, unscrew the battery from the charger and replace your clearomizer. The 1 st time charge for any eGo battery should be for 8 hours, no more, no less. This will set your batteries internal memory and ensure the longevity of the battery. After the 1st time charge of 8 hours, charge the battery for only 3 hours at a time from then on. Leaving the battery on the charger for more than 3 hours, after the 1st charge, WILL damage the battery and WILL void the warranty.